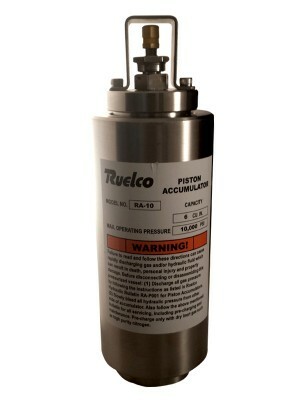 The Ruelco RA-5 is a piston type accumulator that provides a means for regulating the performance of a hydraulic system. It is suitable for storing hydraulic energy under high pressure, absorbing hydraulic shocks, and dampening pump pulsation and flow fluctuations. The 316 stainless steel construction allows for high corrosion resistance in harsh environments. The honed bore and wear ring allow for a smooth stroke, maximizing the total amount of life cycles. The RA-5 can be dissembled and cleaned without the need for special tools. T-seal and back-up ring piston assembly. Schrader valve allows safe charge and discharge. Available in 6 and 16 cubic inch capacities.